Nordrhein-Westfalen is the most populous state of Germany, with four of the country’s ten largest cities. The state was formed in 1946 after the merge of the northern Rhineland and Westphalia. The state’s capital is Düsseldorf. Nordrhein-Westfalen includes the plains of the Lower Rhine region and parts of the central uplands up to the gorge of Porta Westfalica. The state comprises a land area of 34.083 square km and shares borders with Belgium in the southwest and the Netherlands in the west and northwest. It has borders with the German states of Niedersachsen to the north and northeast, Rhineland-Pfalz to the south and Hessen to the southeast. NRW’s most important urban districts are Aachen, Bielefeld, Bochum, Bonn, Bottrop, Dortmund, Duisburg, Düsseldorf, Essen, Gelsenkirchen, Hagen, Hamm, Herne, Köln, Krefeld, Leverkusen, Mönchengladbach, Mülheim, Münster, Oberhausen, Remscheid, Solingen and Wuppertal. 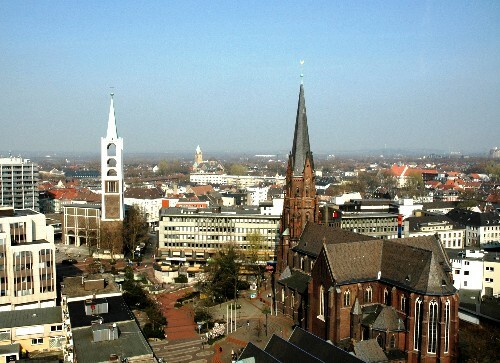 The most populous cities in NRW are: Köln with 1.000.660, Düsseldorf 586.564, Dortmund 580.688, Essen 575.027, Duisburg 501.564, Bochum 385.626, Wuppertal 359.237, Bielefeld 326.925, Bonn 312.818, Münster 270.868, Aachen 258.664, Gelsenkirchen 257.981, Mönchengladbach 257.993, Krefeld 235.076, Oberhausen 212.945, Hagen 188.529, Hamm 181.783, Mülheim 167.344, Herne 164.762, Leverkusen 160.772, Solingen 159.927, Bottrop 116.771 and Remscheid 110.563. The flag of Nordrhein-Westfalen is green-white-red, with the combined coats of arms of the Rhineland and Westfalen and Lippe. According to the legend, the horse in the Westphalian coat of arms is the horse that the Saxon leader Widuking rode after his baptism. Other theories attribute the horse to Henry the Lion. The state is not known for its castles like other regions in Germany. However, Nordrhein-Westfalen has a high concentration of museums, cultural centers, concert halls and theaters. NRW has changed in recent decades like no other German region. And like no other region, the state is banking on culture to do its bit to lessen the impact. The results can be viewed across the country, and especially in the Ruhr. Today, the creative industries employ more people than the mining sector. Industrial heritage sites have been turned into workplaces for designers, artists and the advertising industry. Every year, the Ruhrtriennale festival attracts visitors from all over the world. NRW has an unparalleled concentration of museums, cultural centers, concert halls and theaters. Film festivals in Oberhausen, Duisburg, Cologne, Lünen, Münster, Bonn, Dortmund and other places in NRW provide quality of highest standards. Whilst, in terms of culture, NRW is right up there with London or Paris, there is a big difference: although we have a long tradition of culture and heritage – in fact, the cathedrals in Aachen and Köln, the Zollverein colliery and Augustusburg Palace in Brühl are World Heritage Sites – NRW was never the land of castles, dynasties and landed gentry. NRW was, is and always will be a society dominated by the working and middle classes. The culture in NRW is therefore the great facilitator of change. With around 180 theaters, NRW offers the densest theater landscape in Europe. The Schauspielhaus Bochum is one of Germany’s most renowned theaters. The Philharmonie Köln and the Konzerthaus Dortmund both offer guest performances by first-class international musicians. The Aalto-Theater in Essen is not only a representative venue, but also an architectural sight of international standing. More than 680 museums in the state attract around 15 million visitors every year. The Kunstsammlung NRW in Düsseldorf, for example, show works by the major artists of the twentieth century. The museum Ludwig in Köln houses one of Europe’s most important collections of contemporary art. Schloss Moyland displays many works by the NRW-born artist Joseph Beuys within its walls. Numerous events in NRW are known to an international public. These include the international literature festival lit.COLOGNE, the International Short Film Festival Oberhausen and the Ruhrtriennale culture festival, which takes place agains a backdrop of old industrial buildings. Cooking in Nordrhein-Westfalen is made up of the regional cooking styles of the Rhineland and Westphalia. Popular foods and dishes in NRW are Sauerbraten, Reibekuchen, Spargel, Burg Pretzel, Spekulatius, Bratwurst, Himmel und Erde and Beer. In the 1950s and 1960s, Westphalia was known as the Land von Kohle und Stahl, or the land of coal and steel. In the post:-WWII recovery, the Ruhr was one of the most important industrial regions in Europe, and contributed to the German Wirtschaftswunder. As of the late 1960s, repeated crises led to contractions of these industrial branches. On the other hand, producing sectors, particularly in mechanical engineering and metal and iron working industry, experienced substantial growth. In 2007 the states GDP of 529.4 billion euro (21.8% of the total German GDP) made the land the economically most important in Germany, as well as one of the most important economical areas in the world. Of Germany’s top 100 corporations, 37 are based in Nordrhein-Westfalen. Some of the most notable corporations are E.ON AG, Metro AG, Deutsche Post AG, Deutsche Telekom AG and ThyssenKrupp AG. Ludwig van Beethoven, Heinrich Heine and Joseph Beuys – Germany’s biggest federal state in terms of population has produced many influential artists and is one of the biggest cultural regions in Europe. It’s numerous, theaters, orchestras and concert halls, and its musicals and events, attract millions of visitors every year.